The Most Versatile Necklace Ever! 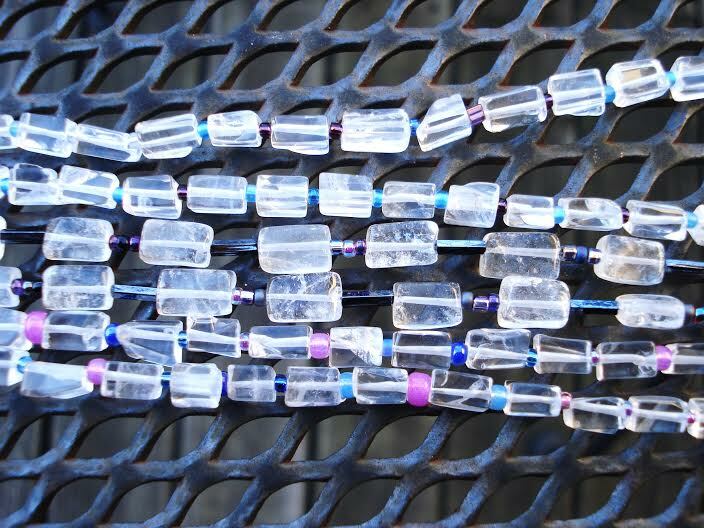 Do you ever find a great deal on beads you love and buy a whole slew of them? Yeah, me too! 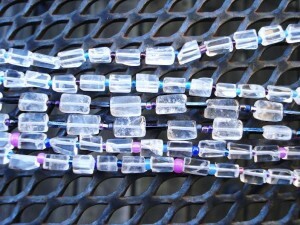 Then comes the design quandary – what the heck do I do with ALL THESE BEADS?!?!? 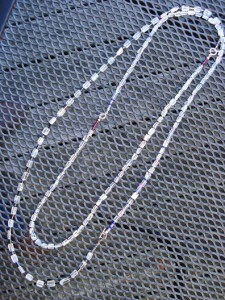 Well, this can be a great project for those beads you bought in bulk. 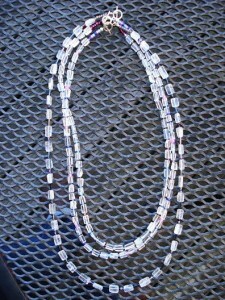 I love to do several simple strung necklaces, all using the same clasp, all slightly different lengths. Then you have multiple different ways you can wear the necklaces! You can wear one or more at a time clasped singly. Because the clasps match, you can connect each necklace to another and wear them long or doubled, allowing you to change the length and making the necklaces more versatile. 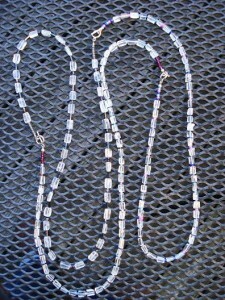 The clasps then become a design element, as they are spaced throughout the piece. 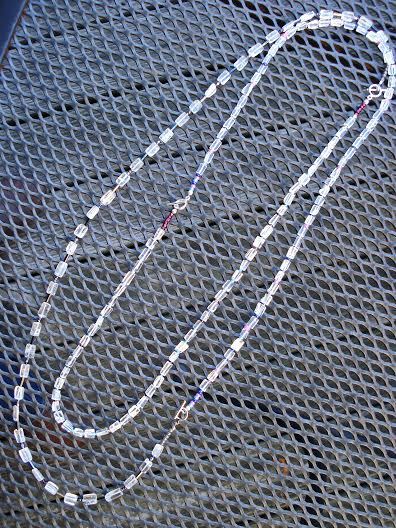 In this case, we had oodles of rectangular, irregularly cut, clear quartz crystal beads in 16” strands. I thought I would inject a bit of color by using a mixed seed bead soup too. In between each quartz bead, I randomly chose a seed bead from the soup as a spacer, and continued stringing in this manner. At each end of each necklace, I have a small section of 8/0 seed beads from the mix, so none of the larger beads would interfere with the operation of the small toggles I used as clasps. 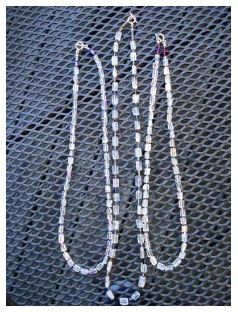 I strung three separate strands of quartz, each with a different seed bead soup, and made three separate necklaces. 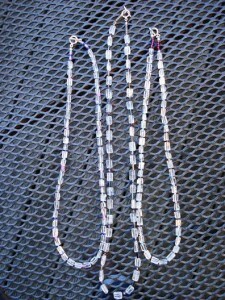 This design can work great with any neutral colored bead. 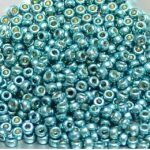 If you have a more colorful bead, I might recommend that you use a neutral colored seed bead as a spacer. Then your main bead will really have a chance to be the star. 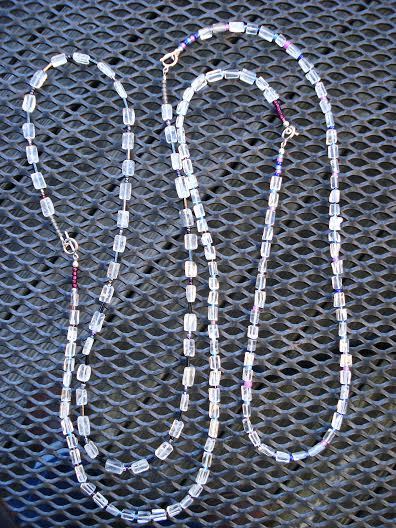 Another great way to do this project is with 3 different but coordinating 16” strands of beads – when you wear them at the same time it looks like a neat color blocked necklace, but you are still able to wear each one individually.